Feniks. Miesiecznik poswięcony zadaniom nowej epoki. Warsaw, Poland. 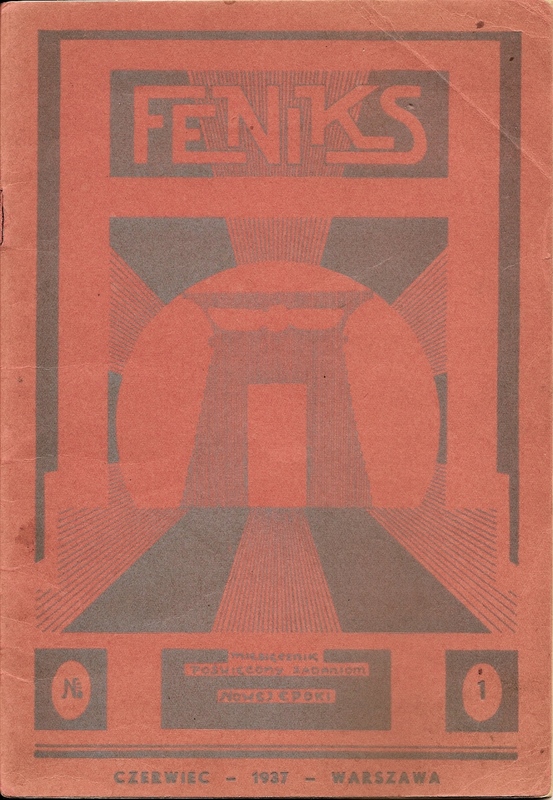 Publisher: Komitet Wydawniczy "Feniksa". Printed in: Zaklady Graficzno–Introligatorskie J. Dziewulski, Warszawa, Senatorska 10. Editor’s office: Warszawa, ul. Akademicka 5/747. Journal not connected directly to any esoteric groups, although promoting themes related to Theosophy, Agni Yoga teachings, Slavic identity, Esotericism, Mysticism, and similar topics. Editor – Jerzy Znamierowski (1895–1992) – was Theosophist and Anthroposophist. A periodical publication devoted to the transformation of collective life and the education of mankind. "We are concerned with the human – the whole human and humankind, both in its own cohabitation on the planet, and in its cognitive and religious–philosophical relation to all-being. (…) We desire, as humans – as particular individuals – to propagate the idea of a deeper knowledge of the world, and through that – of intelligent action towards a change for the better – in the way of order and harmony – of the life on Earth. It seems to us that in the endeavor Poland can and should play a not minor role; and this indeed, in a few words, is the CAUSE that we want to serve." Warsaw, Poland. Language: Polish. Editor: Jerzy Znamierowski. 1/1, June 1937. 42 pp., 1 zl. an issue. Karolina Maria Hess: This was an independent occult journal, unconnected with any esoteric groups, although the editor Znamierowski (1895-1992) was a Theosophist and Anthroposophist. It described its goals as the transformation of collective life and the education of mankind. “We are concerned with the human – the whole human and humankind, both in its own cohabitation on the planet, and in its cognitive and ‘religious–philosophical’ relation to all-being. . . . We desire, as humans – as particular individuals – to propagate the idea of a deeper knowledge of the world, and through that – of intelligent action towards a change for the better – in the way of order and harmony – of the life on Earth. It seems to us that in the endeavor Poland can and should play a not minor role; and this indeed, in a few words, is the CAUSE that we want to serve.” The journal’s themes related Theosophy, Agni Yoga teachings, Slavic identity, esotericism, Mysticism, and similar topics.